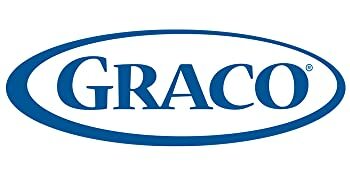 Parents know that Graco is one of the most trusted brands in the market, with the highest commitment to quality, comfort and safety. 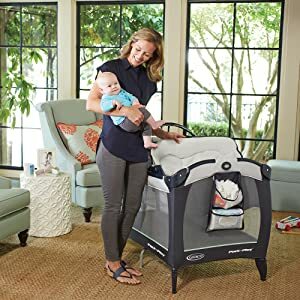 From the introduction of the first wind-up infant swing, the Swyngomatic, to the creation of Pack N' Play Portable Playards, to the 4Ever car seat, Graco continues to deliver innovation that truly matters to parents worldwide. 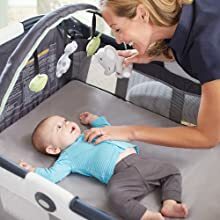 The Graco Pack 'n Play Playard Reversible Napper & Changer offers the comfort of a cozy napper for your newborn and the convenience of a diaper changer, all-in-one. 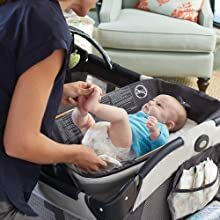 The reversible unit easily transitions from a cozy rest space for your newborn into a changer to make keeping baby clean and content a breeze. 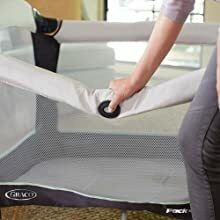 This playard is designed to meet your child's needs as they grow from a newborn to an infant to a toddler. 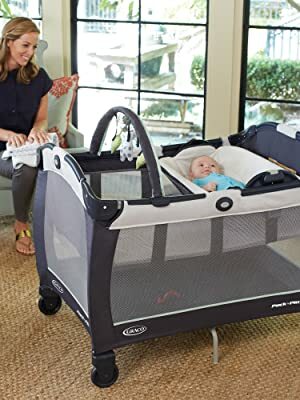 Features include a removable infant bassinet, integrated storage pockets, push-button fold, and sleek, updated frame design. Simply push the locking button to switch from diaper changer to cozy Newborn Napper at a moment's notice! The smart, two-in-one design makes it easy to care for your baby quickly and efficiently. Convenient changer's wipe-clean fabrics make clean up a snap so you can continue enjoying your time with baby. 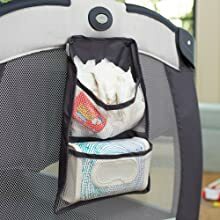 From extra diapers to wipes, toys and more, you'll have a place to keep these essentials right at hand. Toy bar features soft toys to amuse your little one while resting and relaxing in the infant bassinet.